A threatened Grimsby secondary school will stay open thanks to public pressure, council officials have said. Education chiefs had considered shutting Whitgift School despite protests from parents and pupils. 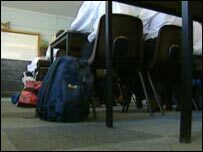 North East Lincolnshire Council said there were thousands of spare school places in Grimsby because of falling pupil numbers. Now it has decided to keep the school open - but others across the town will have to be downsized. Plans are still in place to close St Mary's Catholic School and Matthew Humberstone Church of England School in their current form and open a new joint church school at Chatsworth Place, Cleethorpes. The council predicts that if nothing is done, there could be 34% surplus places in the area's secondary schools by 2016. Government regulations say there should be a surplus of no more than 10% within an authority's schools because it would waste too much money. Council chiefs launched a consultation last year, asking people to comment on the plans. The latest plans are expected to be agreed at a meeting of the council's ruling cabinet on Thursday. Margaret Cracknell, children's services spokeswoman, said: "The reorganisation of the second school estate is of paramount importance to the future of our community. "This is a very exciting time for North East Lincolnshire's schools. "We have welcomed the views of the local community throughout this process and are pleased with the result. "We have a once-in-a-lifetime opportunity to reform and redesign the pattern of secondary education for our pupils." Campaigners who fought against the plans to close Whitgift had feared pupils would have to travel further to school. Chris Dixon, chair of governors at the school, told BBC Radio Humberside she was "absolutely elated" at the news. She said: "We believe we fought a strong campaign. "All the staff and governors wanted was to keep the school open and we believe this is one of the best in Grimsby. "Geographically, it's sensible to keep Whitgift open. We have made that point and people have listened."